Housecats Fluffy and PKP (Princess Killer Pinknose) had it easy living as the pampered pets of musician Colin and novelist Dana Wickey -- until the humans got into financial hardship, and had to get JOBS that took them out of the house during the day. This was 2001, when American households were getting their first home computers. Dana tries to teach Colin how to go onto the Internet, while Fluffy lounges in the background taking notes. That was in Hilgartner’s Cats in Cyberspace (Meisha Merlin Publishing, September 2001). Now it is ten years later, but only a few months in story-time. Brigantine Media/Voyage, Dec. 2011, trade paperback $14.95 (272 pgs. ), Kindle/Nook/iOS $5.99. Fluffy and PKP have successfully set up the online-operating FSSALM – the Foundation for the Serendipitous Support of Arts, Literature, and Music, an anonymous charitable organization whose real purpose is to give the Wickeys enough “StealthCharity” arts grants that they can afford to quit their jobs – with a “regional” office across the road from their rural house for added security. The two sisters spend most of their time there while Dana & Colin are busy at their composing and writing or not at home. Fluffy (the narrator) is the main administrator of FSSALM’s affairs, while PKP has her own computer and occupies herself making money. Things are normal until FSSALM gets an e-mail from Jonathan Parkham, a “New York Observer” reporter interested in doing a story on the work of FSSALM. While Fluffy is deciding what to do about the request (and PKP works on her brokerage account with her usual grumpy “Don’t bother me!” attitude), the two cats are startled by someone breaking into their office. The cats observe while the lone intruder looks around, makes notes of the latest writings on their computers, and leaves without taking anything. The coincidence of the clandestine search at the same time as the request for information about FSSALM’s activities makes Fluffy suspicious that Parkham is actually an investigative rather than a financial reporter. She becomes sure of this when she finds out that PKP, in addition to trying to corner the Asian currency markets, has set up her own blog to tell people what “he” thinks of the current political and social scene; not revealing that this is a cat commenting on human affairs. Rather, PKP has been posting her sardonic opinions, and a fan has volunteered to organize them into “PKP’s Weekly Political Invective”, the centerpiece of his well-designed, attention-getting political commentary website. In fact, as Fluffy scans the “utterly vicious commentary on current events”, the website seems to consist of little besides PKP’s leave-no-survivor rants. The moderator is a Forsythe Elliott McMaster at Columbia University -- maybe. To aid in their deception, the cats need a human Office Manager to come to FSSALM every day. Young Sophie Marchant seems perfect; she’s reliable, industrious, discreet, and loyal to her always-absent employers who send her frequent e-mail instructions. But Sophie and Dana Wickey start socializing as friendly neighbors. Fluffy and PKP worry that the two women will innocently discover that they are more closely linked through FSSALM than they realize. Then Sophie gets an office pet, Ginger the kitten, and Fluffy has to defuse feline rivalries between PKP and Ginger that risk exposing them. As long as Parkham is hanging around the FSSALM office to see her, Sophie lets him use the office’s “extra” computers to work on his story, and he inadvertently(?) changes Fluffy’s and PKP’s passwords. These turn out to be minor problems. Things start to get hairy (Furry?) when PKP’s political chats start becoming so well-read that prominent politicians began debating with “him” via her website. Popularity breeds more popularity, and PKP is invited to write a guest editorial for the Observer. PKP is insufferable about this recognition of her genius; she is less sure how to take it when it turns out that it was Parkham who suggested this to his editors. PKP’s editorial, with the tagline, “Put the guts back in politics!”, becomes widely talked about. All this time, PKP is very careful to maintain strict anonymity. A few public suggestions that “he” should come out of hiding and run for office do not tempt her. She is having too much fun baiting the stupid humans, and she realizes that a publicly revealed cat could never get elected to anything. But Ginger, who has become computer-savvy under Fluffy’s tutelage, sees this as an opportunity. What about all those “Pogo for President” or “Gandalf for President” gag campaigns of the past? Campaigning for a ridiculous candidate as a protest vote is a time-honored tradition. 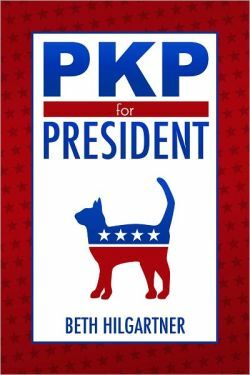 Ginger, through e-mail, persuades PKP’s webmaster, Forsythe McMaster, and Jonathan Parkham to start a “PKP for President” movement; only she doesn’t tell them that it’s supposed to be a gag. PKP, alarmed, tries to stop it, but it has gathered too much momentum by this time. “Draft PKP!” rallies take place on the Columbia campus. The more public support for PKP there is, the more concerned people (especially the established political parties) become with tracking down who PKP really is. Fluffy and Ginger have their own problems. This is the long-awaited sequel to Cats in Cyberspace. Almost as soon as that was published, Meisha Merlin advertised the forthcoming sequel, announced at the time as “Prey-Part Politics”. But the book was delayed, and then MM went out of business. The fans of Fluffy and Princess Killer Pinknose despaired of ever seeing it. But here it is at last, under a different title but still as enjoyable as expected, and standing up well on its own. Meisha Merlin is long-gone, but Cats in Cyberspace is still available from Amazon.com. That sounds pretty cool, I'll have to keep an eye out for it. But 2001 when homes were getting their first computers? They would have been getting them for at least a decade before then. The first home computers may have become available in the late 1980s or early 1990s, but around 2000 was when *everybody* got a home computer, I remember the first Furry BBS's in the late '80s which were maintained largely by college campus dorm or housing group-owned computers; also alt.fan.furry which started in November 1990 when home computers were very rare. I got mine in 1997, and while a lot of my friends said, "It's about time! ", a lot more were still computerless for a few more years.